I originally bought 6 of these knives for Christmas gifts for friends, but after receiving them I decided to get a couple more for myself.They are great for stashing in the tackle box. I originally bought this knife during a BOGO event here on Bud K to put in our backpacks for whenever we might end-up fishing for dinner. We all know that that a filet knife is indispensable when cooking fresh fish, and the price was right. Judging the quality by reading the reviews, I felt confident that the knives were worth at least what I was paying, and added two of them to my shopping cart. I was pleasantly surprised when I opened the box and checked these filet knives out! The heft of these knives is quite nice, and they are much larger than I thought they would be (similar in size to my Henkels Four Star kitchen filet knife) and had a very nice edge. A few strokes on the honing steel and they had a razors edge and fileted my "test fish" perfectly, even removing the skin without taking any meat. I immediately decided one was staying in the kitchen and the other was going in my pack, and that I would buy a couple more next time I place an order. I really like this knife and recommend it to everyone, whether for kitchen, tackle box, backpack, camping kitchen, or whatever! Like one of the previous reviewers said, "go ahead, buy this knife. You won't regret it". BUDK has done it again. I got not one but two of these filet knifes. $9.99 BOGO with free shipping. I'm still in disbelief. What a great deal. Very sharp! Perfect gifts for my Dad and brother. Only problem is that I didn't get more. Now I have to buy some more for my son and myself. Perfect for any fishermen. Usually when I see "Made in China" I am instantly turned off. I guess my senses are still attuned to the 1980's and quite Pavlovian in response. But when I opened this Ridge Runner Folding Fillet I was pleasantly surprised. I'm very pleased with the quality of the knife. I have purchased several of these knives from BudK. I have given them to almost everybody I know. The knife is inexpensive, but yet has excellent quality. Just the right amount of flex, not to stiff and not to flexible. I fillet a lot of salmon and this knife has worked far better than any other fillet knife I have found. 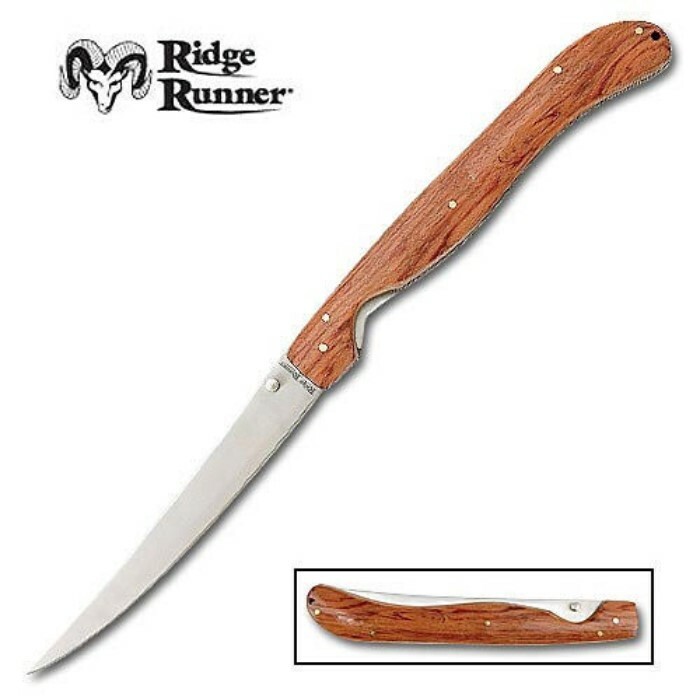 I have used at least 6 to 8 different brands and I always come back to the Ridge Runner. I was searching for the best fillet knife for the value and it stands way above any other. You name it and I have probably tried it. It is even better than my Case fillet knife that I paid quite a bit more for, and I am a Case knife fanatic. Do yourself a favor and buy this knife, it will be the only one that you need and trust.